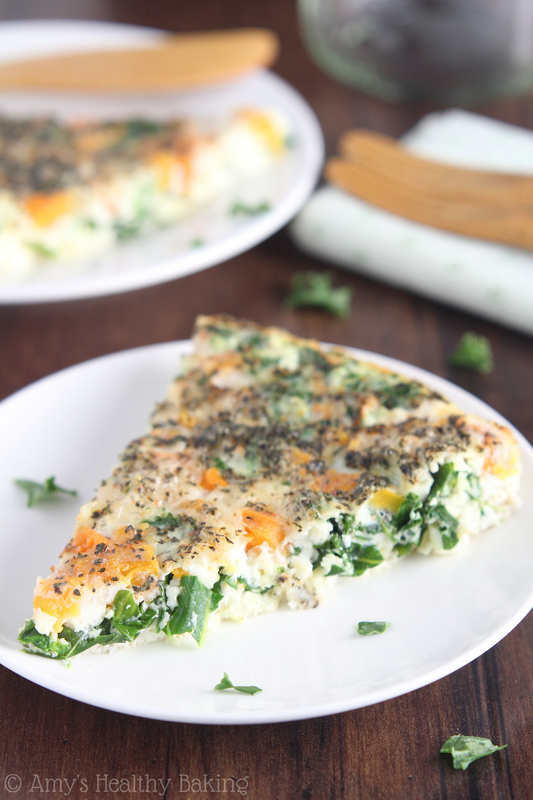 A 6-ingredient recipe for a crustless quiche filled with healthy veggies. It’s packed with protein to keep you full all morning long! My first year at college, all of the freshmen were guaranteed a spot in the dorms, which meant that I ate most of my meals in the dining commons (or “DC” for short). Since I preferred quiet mornings, I pour my typical bowl of Trader Joe’s cereal in my room, as opposed to wandering down to the DC, but I spent most of my evenings scouting out the dinner options with my roommates and friends. Most of the DC stations concentrated on protein and carbs, and very few actually offered vegetable sides. If they did, 95% of the time the veggies were covered in oil or deep-fried—not exactly healthy! So I almost always threw together something from the salad bar instead. However, one of my friends came back to our table one night with a big stack of squash on his plate. It looked steamed or barely roasted with basically no oil in sight! So I immediately asked where he found it. After visiting the station and loading up a new plate, I quickly dug in. Its soft texture and sweet taste were so welcome compared to the monotonous salad bar! And ever since then, I nearly constantly crave squash during the winter. 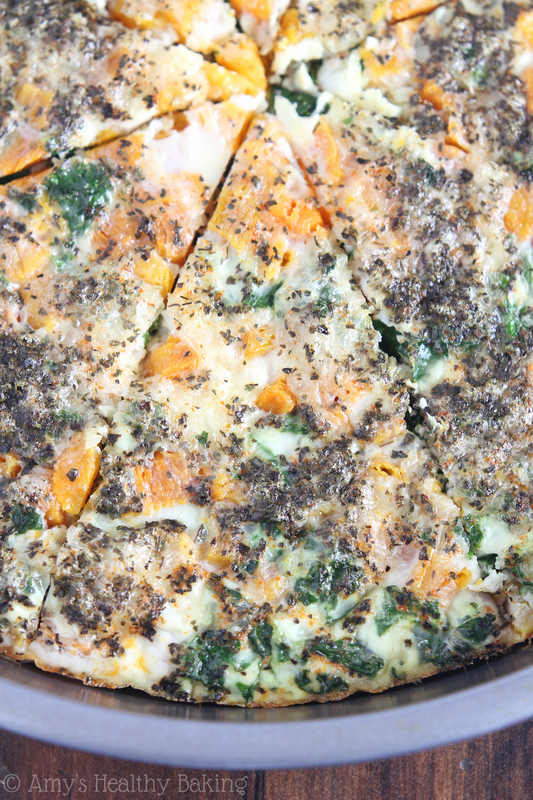 So when I had half a bag of kale left after my TV segment, I combined it with this delicious winter veggie to make this Skinny Kale & Butternut Squash Quiche. It’s really easy, just 6 ingredients, and packed with protein! In the mornings, I’m all about the no-fuss breakfasts, especially when my eyes haven’t quite fully opened. 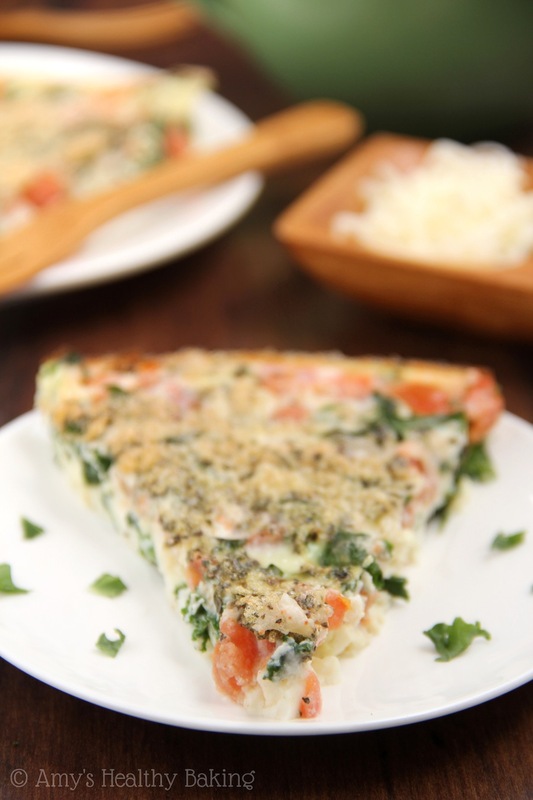 That’s exactly what this healthy quiche is! Whip it up over the weekend, and reheat the leftovers for meals throughout the week. I’ll sometimes make a double batch to snag a few extra minutes of sleep! It’s important to cook both of the veggies first before you add them to the baking pan. They won’t soften enough if you put them in raw. I prefer to steam by butternut squash in the microwave to save time, but if you’ve already roasted some or have leftovers, go ahead and use that instead. When picking out the kale leaves, make sure you discard the thick ribs from the centers of the leaves. They stay crunchy, even after cooking! Be sure to shred or slice the leaves finely too. 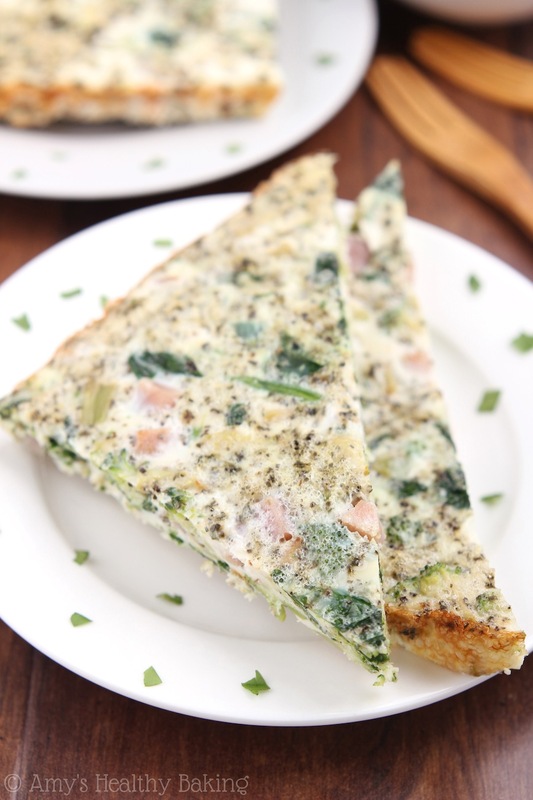 The smaller pieces of kale help when you’re cutting the quiche into slices because they won’t catch on the knife and rip the eggs apart. Then all that’s left is egg whites, spices, and cheese! It’s nearly impossible for me to leave cheese out of egg dishes… I grew up on cheese omelettes, after all! I only sprinkled a tiny bit into the pan, but you’re welcome to leave it out if you prefer. 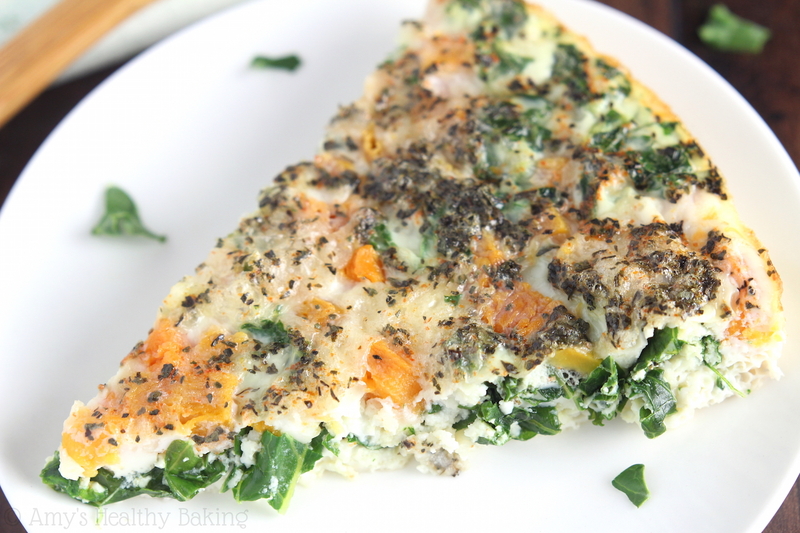 The subtle sweetness from the squash and the cozy cheese factor make this Skinny Kale & Butternut Squash Quiche one of my new favorite breakfasts! It leaves me feeling satisfied, motivated, and powers me through my entire morning. And during the winter when I just want to crawl back under the covers, that’s saying a lot! 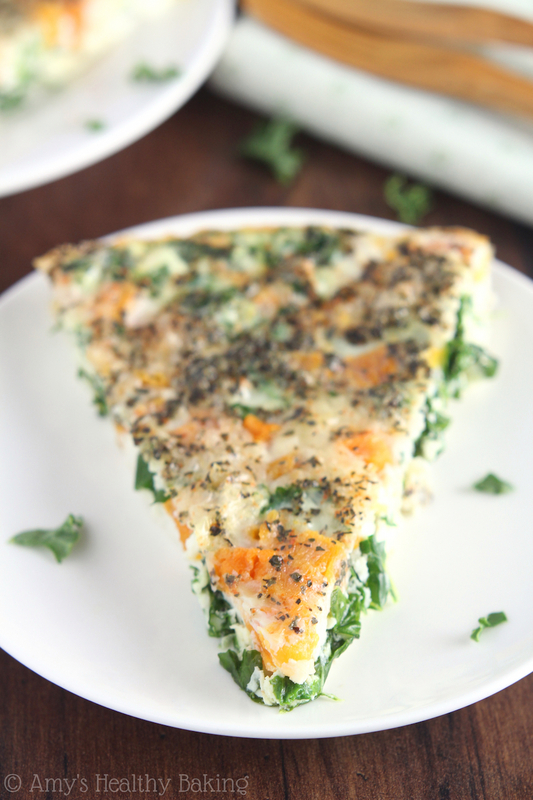 This easy quiche is packed with vegetables and protein to keep you full all morning. 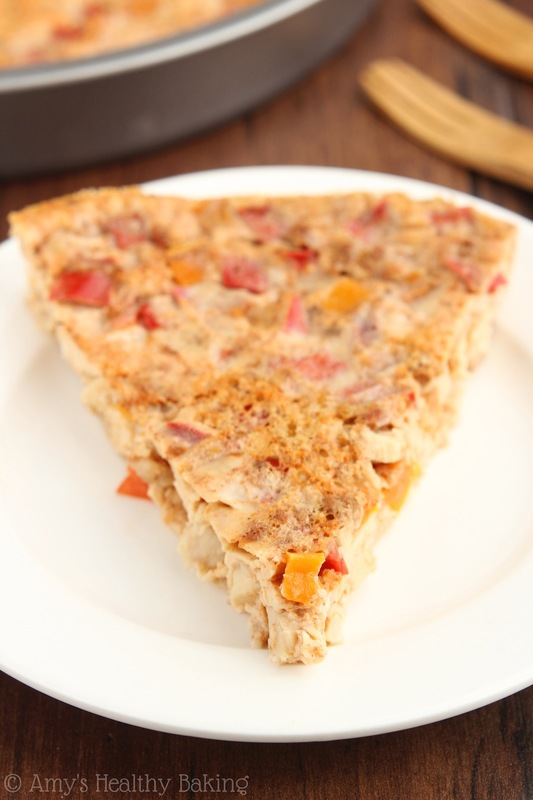 The leftovers reheat really nicely, so you can have breakfast throughout the week! Preheat the oven to 325°F, and lightly coat a 9”-round cake pan with nonstick cooking spray. Add the butternut squash to a microwave-safe bowl, and tightly cover with plastic wrap. Microwave on HIGH for 3 minutes. Remove the plastic wrap, and when the butternut squash is cool enough to handle, chop it finely and sprinkle into the prepared pan. While the butternut squash cooks, add the kale to a pan lightly coated with nonstick cooking spray. Cook, stirring constantly, over medium-low heat for 2-4 minutes or until the kale is dark green and completely wilted. Remove from the heat and sprinkle into the prepared pan. 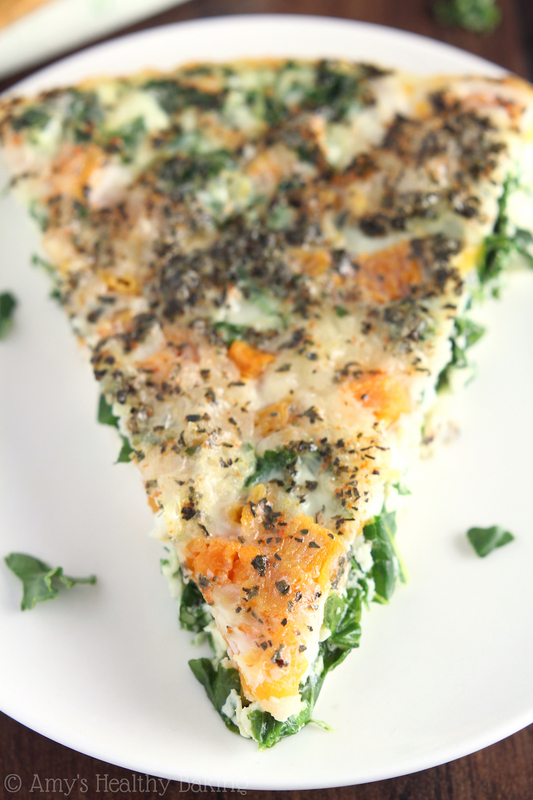 Sprinkle the mozzarella on top of the butternut squash and kale. In a large bowl, lightly whisk together the egg whites, basil, and cayenne. Carefully pour the egg whites into the prepared pan. Bake at 325°F for 35-40 minutes or until the center no longer jiggles. Cool for at least 5 minutes before slicing into 8 wedges. Notes: I used butternut squash that was precut and came in a bag. Be sure to remove any of the thick ribs from the kale and just use the leaves. I measured my egg whites from a carton, but 12 large egg whites may be substituted instead. Adjust the herbs and spices to suit your taste! Thanks for this recipe! I am trying to eat healthier…on The DASH diet and this looks like it would fit into the plan. I also like that it is crustless. I will probably used whole eggs, though. Thanks again! My pleasure, and I hope you enjoy the quiche Roni!